Historically, in the US, training of professional mountain guides has been very loosely organized. While some guide services conduct their own in-house training, few guides have any formal, consistent and comprehensive training. As a result, anyone can hang up a sign and claim to be a guide. Only a few climbing areas such as, The Mohonk Preserve (Gunks) or Joshua Tree National Park require any training or evaluation in order to guide. Picture this: a guide and client are 600 feet off the ground, 500 feet from the top and a violent summer storm comes pounding in. Getting out of this potentially dangerous situation calls upon a guide's expertise and training. Although risk can never be completely eliminated, proper training can help minimize it. Climbing skills alone are not enough. Guiding experience and training, as well as evaluation of guiding-specific skills, are essential to maximize competency and greatly reduce potential hazards. Most people expect formal training of a doctor or lawyer. Shouldn't you ask the same from your guide? One of goals of the American Mountain Guides Association (AMGA) is to raise the technical and professional standards of mountain guiding in the United States to a worldwide level. For the consumer, the AMGA can be the tool to help choose the right guide or guide service. The AMGA is this country's only organization to offer a comprehensive training program for mountain guides that is recognized by the International Federation of Mountain Guides Associations (IFMGA, aka UIAGM). 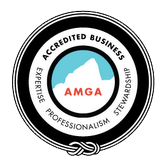 Choosing a guide that is certified by the AMGA ensures that the individual has demonstrated an acceptable level of skills (client care, risk management, first aid, etc. ) that separate the professional guide from the recreational climber. It is the only American guiding standard recognized by the IFMGA/UIAGM. An IFMGA Certified Mountain Guide meets the world standard in all three disciplines of rock, alpine and ski mountaineering and is part of a select group of guides who can legally work in more than a dozen other IFMGA-member countries. The AMGA also has a program that accredits climbing schools. An Accredited company has passed a detailed review of climbing activities, hiring policies, permits and insurance. How do you select the right guide? Ask the following questions in addition to considering Certification and Accreditation. Does the person or guide service have insurance? Will the person or guide service provide a list of previous clients as a reference? How long has the person been guiding or how long has the guide service been in operation? If the trip will take place outside the guide's home base, how familiar is he or she with the destination/terrain? With all these points to contemplate, please take your time and talk with the guide or service you are interested in working with. Alpine Endeavors is an AMGA Accredited program, and we require all of our guides to be AMGA certified in at least one discipline.